Thanksgiving is right around the corner. I believe in celebrating healthy holidays, so much so, we have regularly hosted Thanksgiving, serving our unsuspecting guests low-carb, gluten-free and sugar-free dishes. The picture on the right was last year's spread; everyone left the table with healthy and happy tummies. Once again we will be hosting Thanksgiving only with an added twist, it will also be dairy-free. Over the next few weeks I will be practicing (and sharing) my recipes, some the same as last year and some new ones. All of them delicious and healthy. When the big day comes I will be ready (and so will you). #1 Tip for celebrating healthy holidays, offer to host! 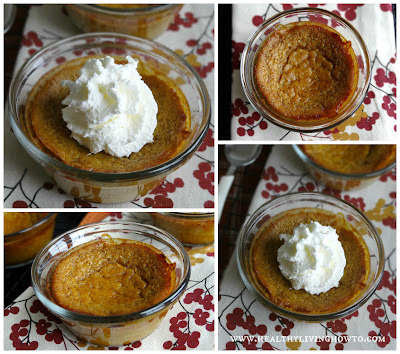 There is no shortage of pumpkin recipes here at Healthy Living How To, but I figured I'd start with an easy low-carb, sugar-free, dairy-free and gluten-free healthy Crust Less Mini Pumpkin Pie recipe. You don't have to wait until Thanksgiving to make this healthy recipe, in fact I ate it for breakfast, after eating my eggs and bacon. Making pumpkin pie from scratch is really quite simple, other than the obvious pumpkin, it's just spices, eggs and sweetened condensed milk poured in a pie crust. I looked up the nutritional information of the sweetened condensed milk to get a comparison of my healthy pumpkin pie recipe versus a traditional pumpkin pie, and my eyeballs just about popped out of my head. One 14 oz. can of sweetened condensed milk has 294 grams of sugar! The beauty of living a low carb lifestyle is you can still celebrate healthy holidays and eliminate sugar or significantly reduce sugar consumption at the same time. It can actually be quite simple. Take today's healthy recipe for example, all I did was swap out the unhealthy sweetened condensed milk for healthy coconut milk combined with my favorite natural low-carb sweetener, Swerve, and voilà we have a healthy low-carb holiday dessert. In a medium bowl, using electric beaters, combine pumpkin, coconut milk, pumpkin pie spice, salt, stevia and sweetener until smooth. Add eggs one at a time and mix just until incorporated. Place eight oven-safe custard cups on baking sheet. Fill each custard cup with scant 1/2 cup filling. Bake 15 minutes then reduce oven temperature to 350 degrees F and continue baking 40-45 more minutes. Cool completely on rack for 1 hour or until set. Top with dairy free whipped cream, serve and enjoy!